Have a question on Cruze? Cruze is available in 11 different colors - Velvet Red, Summit White, Steel Gery Metallic, Pepper White Non Metallic, Black Metallic, Carbon Flash Metallic, Switchblade Silver Metallic, Deep Forest, Old Blue Eyes, Red Bean Smoothie and Burnt Coconut. Watch latest video reviews of Chevrolet Cruze to know about its interiors, exteriors, performance, mileage and more. With Chevrolet Cruze's entry in the market in the year 2008, Chevy made its presence in the segment of compact cars giving competition back to other cars in the line-up such as Toyota Corolla and Hyundai Elantra. Though these cars are known as average mid-range autocars, they make up for the highest selling attributes of the company's line-up. Cruze, being a flagship in many countries across the globe has truly defined the brand statement of Chevy with its Cruze Sedan and Cruze Hatch variants. For Middle East, specially UAE it was launched in variants packed in 1.8-litre engine in hatch as well as sedan and not surprisingly, the drive has received a brilliant response considering mid-level compact cars. Chevrolet Cruze comes packed with special features that leaves Cruze's stylish impression on you as soon as you enter the cabin. It is a subcompact vehicle, but there is sufficient space inside whether talking about legroom, shoulder room or cargo, you will not feel glutted under any circumstance. Seats are covered in leather upholstery with heat function to provide you supreme comfort & support. Fun segment is loaded with 7-inch color touch screen integrated with Chevrolet MyLink, RDS radio, CD, MP3 player, aux-in, 4/6 speakers, steering wheel mounted audio & Bluetooth controls and USB port. Besides, smartly placed luggage compartments house your small handy things & cargo, including 450-litres of boot space, dashboard storage box, glove box, front cup holders, rear armrest with storage compartment and many more. The smart flowing exterior design of Chevrolet Cruze offers you choice to select the style– 4-door sedan or 5-door hatchback. Whichever car you hold upon, it ensures and creates a sense of harmony with its outstanding exterior profile. Its bold layout starts with twin pod front grille, assertive stance, 15-16 inch steel/alloy multi-spoked wheels and flows till the end in sweeping coupe-like roofline. Overall dimensions for Cruze Sedan are measured as 4597 x 1788 x 1477mm (L x W x H) along with the wheelbase of 2685mm. Whereas, Cruze Hatch is proportioned as 4510 x 1790 x 1475mm (L x W x H) and wheelbase of 2685mm. Not just the exceptional design layout is all about to define about the Chevrolet Cruze, beneath well designed sculpted body there lies powerhouse integrated with 1.8-litre engine. This 1.8-litre DOHC engine whop out maximum power output of 141 hp at 6200 rpm along with the peak torque of 176 Nm at 3800 rpm. This power expelled by the engine gets compliment by 6-speed automatic transmission in all the five trim levels available (Sedan - LS 1.8 AT, LS 1.8 AT, LT 1.8 AT Hatchback – LS 1.8 AT, LT 1.8 AT). On an average, these variants delivers mileage of 7.8 L/100km driving in combined cycle. You can breach 0-100 kmph speed mark with this engine in 10 seconds and the maximum speed of the vehicle is 200 kmph. For safety and better handling techniques Cruze interior features supports you and your driving style. Rear vision camera displays approaching objects to the vehicle in the back side through touch screen centrally placed in the centre stack. Easy entry/exit is allowed in the car through pressing the sensors on the door handle, not needing the manual input of key. Above all, the frame structure of the car is made following the Body Frame Integral System (BFI) that increases the handling, stability and solidity of the vehicle. Other safety aspects loaded in this car include 4 airbag system, side blind zone assist through side mirrors, antilock braking system, traction control, seatbelt reminder for driver & front passenger, immobilizer and more. Although this subcompact car doesn't lead the small car segment in the market as there are other cars, with slightly more promising features. Still it can be loved it for its affordable price range offering symphony of elegant styling, decent power house, spacious trunk & stereo segment. What is the price of Chevrolet Cruze? 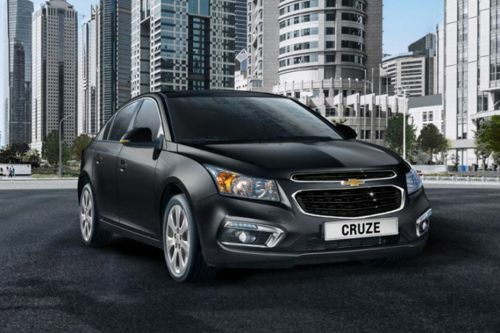 On road prices of Chevrolet Cruze in starts from AED61,950 for base variant 1.6L Elegance, while the top spec variant 1.8 LT Hatchback costs at AED80,850 . What are the colors options available in Chevrolet Cruze?